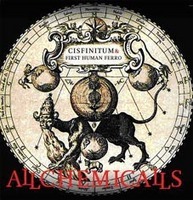 JG Thirlwell has a spoken word vocal cameo on the new album by Cisfinitum & First Human Ferro, entitled Alchemicals. Thirlwell met the musicians when in Russia on the first Manorexia dates, and the text is inspired by his impressions of the former Soviet Union. The album is dedicated to the memory of the recently deceased Dimitry Zuboff, who had also used the text on his Hypnoz project. Alchemicals is a limited edition of 300 copies.